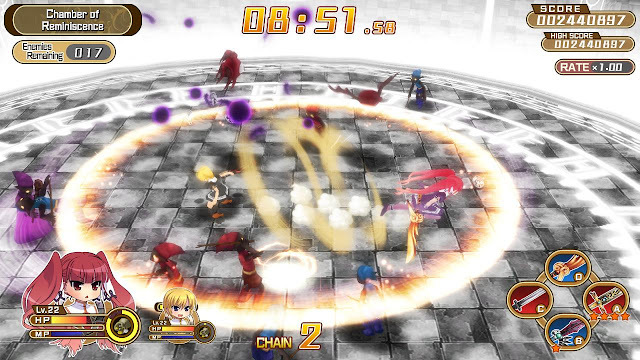 Croixleur Sigma, which originally released upon the PC last year, has now made its way to both Sony’s PlayStation 4 and its Vita. Featuring a mysterious tower that acts as a spawning ground for monsters to pour out of, in this game you'll be exploring and battling with one of four very different women in a fast, frenetic, and entertaining brawler. Related reading: Check out our review of the PC version of the game, for a second look at it. 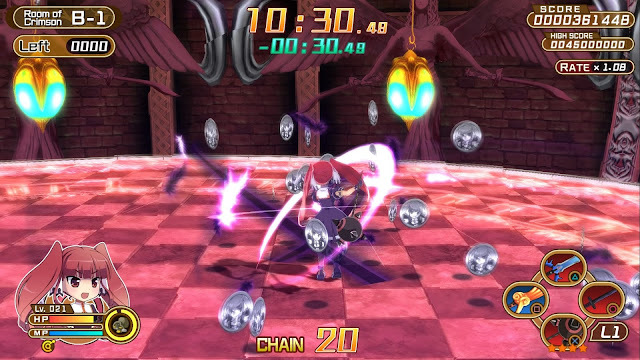 Mechanically Croixleur is an amazing, fast paced brawler that offers four different women, twenty different weapons, and two overly different gameplay styles, and wraps that up within some roguelike trappings. The brawler core means that it will offer the nostalgic a good rush back to the heady old days of action gameplay. What is consistently disappointing about the genre, however, is its narrative. Outside of the work of a couple of masters (Goichi Suda's Killer is Dead and Lollipop Chainsaw call to mind), this is not a genre that people who enjoy narrative will get stuck into. Croixleur, to its great credit, tries hard. Each of the women have unique personalities and there's a sense of lore about the experience, though it might still be a little thin in the eyes of some. The goals of our four protagonists differ from one another as does some of the system implementations that they follow. Taking the reigns from the beginning in order to guide players into systems and flow of gameplay is Lucrezia, the aristocrat, who is pitched in as in conflict with fellow hero, Francesca, a knight. Both protagonists, with the later unlocked as the game progresses, are competing to survive on the way to the top of the tower, which, in addition to being a source of stuff that needs to be killed, act as an exam of sources for would-be heroes. Instead of simply leaving that premise at the bottom of the Tower, these two keep bumping into one another over the course of their journey upwards, with banter, both comedic and otherwise, giving us a little more of a glimpse into the world and personalities within it than you might have expected from such a simple, generic setup. It helps the replay value, too, with some events being seen from different perspectives by each character that witnesses them, to give them greater context. By proceeding as such, it gives more of a reason to explore the tower with each than the mechanical differences between the girls. With different possible endings that is dependant upon performance, unlocking new scenes will require a bit of skill from the player’s hand in order to reach each character’s final ending. There's reason for the people who played through the PC game to take a second bite, too. 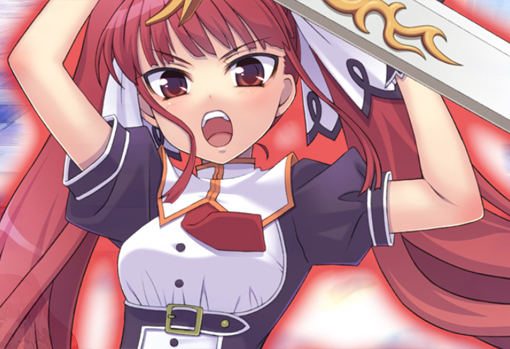 New to the PlayStation version of Croixleur are Katerina and her bodyguard, Sara-Annika. Katerina is the Queen’s sister, and this princess is one that I think everyone can be glad is not sitting on the throne. Unlike Lucrezia and Francesca, Katerina and Sara work side by side. It's a little disappointing that the developers went to so much effort to create these characters and then didn't differentiate them from the existing duo, however. There are definite parallels between these two and the previous pair in the weapons they use and how they use them. Further, anything unlocked with Lucrezia can be used by Katerina and likewise for Francesca and Sara. What differentiates these pairs, other that each’s special ability and special move sets, is that when playing with the new characters, their weapons are destructible, which entirely changes how to approach certain situations, and adds a nice risk/reward component to the battles - do you use your favourite weapon for this battle, or hold on to it for the next, potentially more difficult, one? Where the roguelike element comes into effect is that all character experience is lost on a game over. The only real thing to ever carry over to a new game is the experience that weapons gain, and money. Money was interesting as it was split into both gold and silver coins which were both required in order to buy costume items that could not only be used to accessorise, but also gave bonuses dependant upon the item. If the item looked a bit too ridiculous for a player’s personal taste however, they could be visually disabled while still providing the wanted bonus. Beyond the story mode there are a couple of different ways to play; survival, dungeon, challenge, and score attack. Each of these modes offers a different approach to the action but regardless of the approach the goal remains the same. Brawl your way through the hordes of enemies that lay in the way of the goal. The action itself is more than sustainable for hours on end as some of these are extremely challenging even when playing co-op - which is a blast in and of itself. Sadly, a limited blast. Whoever joins in with a second controller, can only participate in selected modes, is automatically set to use Francesca and had no options for a weapon loadout. Accessories thankfully could be counted if they were set prior to this point, but otherwise the second player is sadly out of luck and are forced to survive with nothing more than the default weapons. On a bright side, if they fell in battle it was not a game over. This is especially disappointing as there are some superb co-op experiences on the PlayStation 4 now - Diablo 3, Fat Princess Adventures, Gauntlet, to name a few, so having such a limited multiplayer component here is really going to restrict its long-term value for people that care about such things.